Zak Hardaker has quickly settled into life as a Wigan Warrior - despite being made to wait for his debut. That is the verdict of fellow Yorkshireman John Bateman, who says the former Man of Steel has already made an impact at Wigan during training. Bateman said: "It’s good to have another Yorkshireman here for a bit until I go! "He’s settled in well and he sets some high standards - even if he has come back a little chunky monkey! He’d be the first to admit that, but he lifts the tempo of training and things like that. "Before he got banned he was in the top three players in the league without a doubt, and personally, I still think he’s up there. When he’s back playing he’ll show that." Hardaker's doping ban runs until November but under UK Anti-Doping rules, he was allowed to link-up with new club Wigan two months earlier. Bateman, leaving at the end of this season to join Canberra, said: "I’m pretty gutted I’m not playing alongside him, and we have had a few chats speaking about how it’s a shame we won’t get to do that next year. "You can see in training how good he is, and when he gets going, we need to take full advantage of him because he’s up there as one of the best in the world." He joked: "He’s renting my house off me while I’m in Australia so I want him to stay as long as possible obviously!" Bateman led Wigan out at Huddersfield on Thursday night as they claimed a seventh straight win. They wrap-up their Super-8s campaign at home to Hull FC on Friday, before hosting Castleford seven days later in a semi-final - with a Grand Final spot at stake. 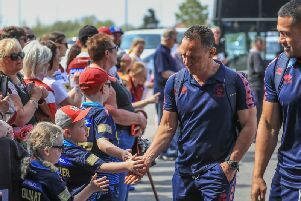 Their surging run of form contrasts to a mid-season blip which Bateman attributes in part to news Shaun Wane, Sam Tomkins and himself were departing at the end of the season. "When it all came out, it happened when we were going through a tough period. We didn't speak about it, but we knew what it meant to each other to leave on a high," he said. "To be able to get to that Grand Final, you can see how much it means to everyone. The spirit among the group is incredible."